From time to time, and especially if you’re a fan of science fiction, you may have had the thought that nobody around you is actually real. That sentiment has taken root in anti-progressive parts of the internet as a dehumanizing meme, and it borrows some familiar gaming terminology. 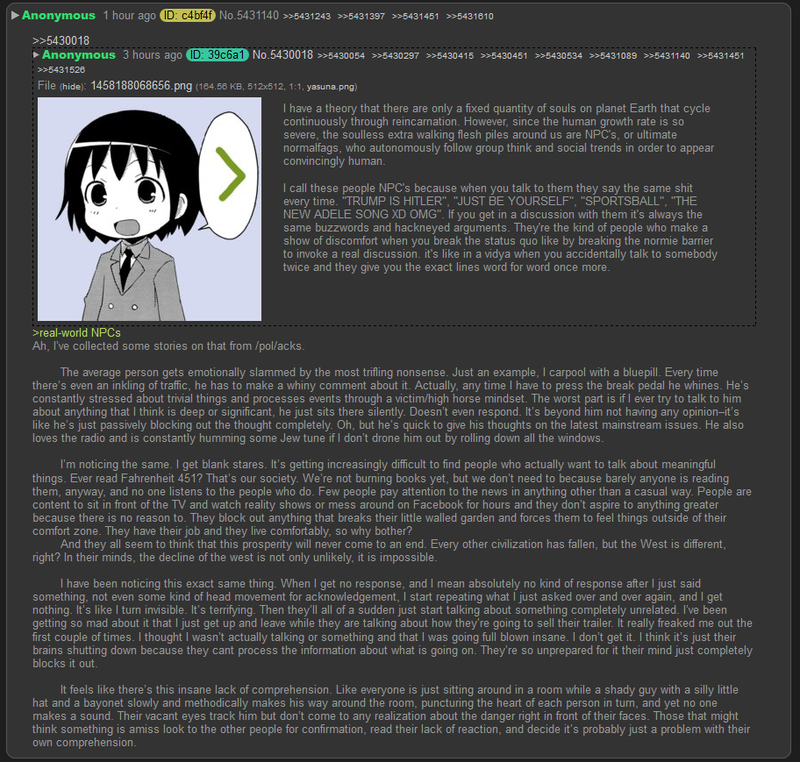 Part crackpot social theory and part elementary school insult, the NPC meme originated from a deeply comical medley of bogus physics and stupid religion found on the messaging board 4Chan. Originally posted in 2016, it resurfaced last month. “I have a theory that there are only a fixed quantity of souls on planet Earth that cycle continuously through reincarnation,” a 4Chan poster wrote. “However, since the human growth rate is so severe, the soulless extra walking flesh piles around us are NPC’s [sic], or ultimate normalfags, who autonomously follow group think and social trends in order to appear convingly human.” NPCs aren’t even worthy of a classic wake up, sheeple. They can’t! Essentially, some large portion of society (normies, pop-culture fanatics, and Trump-haters, among others) who speak in cliches are, in fact, NPCs with no internality, agency, or capacity for critical thought. Like townies in Pokemon idly parked outside the same house day and night, constantly ready with the same contrived one-liners, these IRL NPCs aren’t thinking for themselves. They can’t. What makes this marginal, stale meme built on edgelord logic worth half a thought is what the idea of an NPC speaks to. NPCs have no agency; NPCs don’t think for themselves; NPCs don’t perceive, process, or understand; NPCs arrive at the same worldview not because it’s authentic to their experiences, but automatically. As a descriptor, it suggests that those to whom it applies aren’t even human, but are rather, functionally, robots, or clusters of computer code. That this has resonated as widely as it has is funny, but also a little scary. It’s one thing to claim that a person’s strongly-held views are informed by nothing at all, but entirely another to imply that they’re completely on auto-pilot. That is dehumanization, a way of reconceiving your enemies as objects, pawns, strawmen, tools. At best, dismissing large swaths of people you disagree with this way betrays a lack of empathy for people whose experiences differ from yours, and an unwillingness to consider that if a vast number of people happen to agree over something, it may be good to examine why; at best, it is a great utility for spreading bogus conspiracy theories. 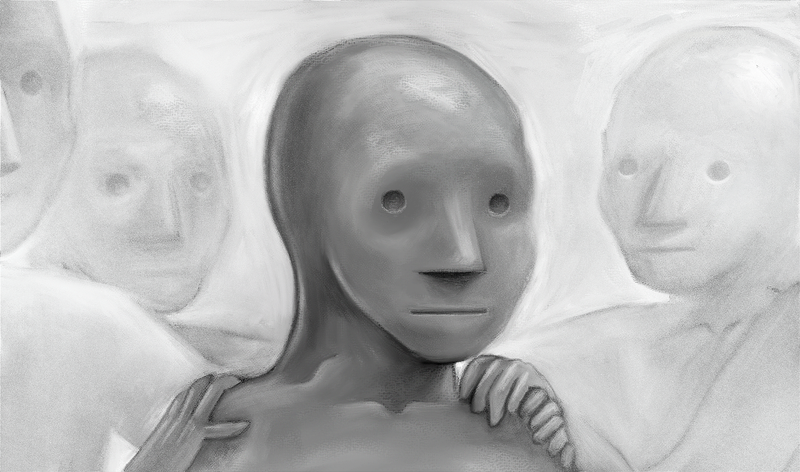 But who among us can say they’ve never mashed “A” as a some expository NPC rambled on, wishing all the while they had the option to silence them or worse?